Prepare packaged red beans and rice with about 2 tsp Worcestershire sauce added. 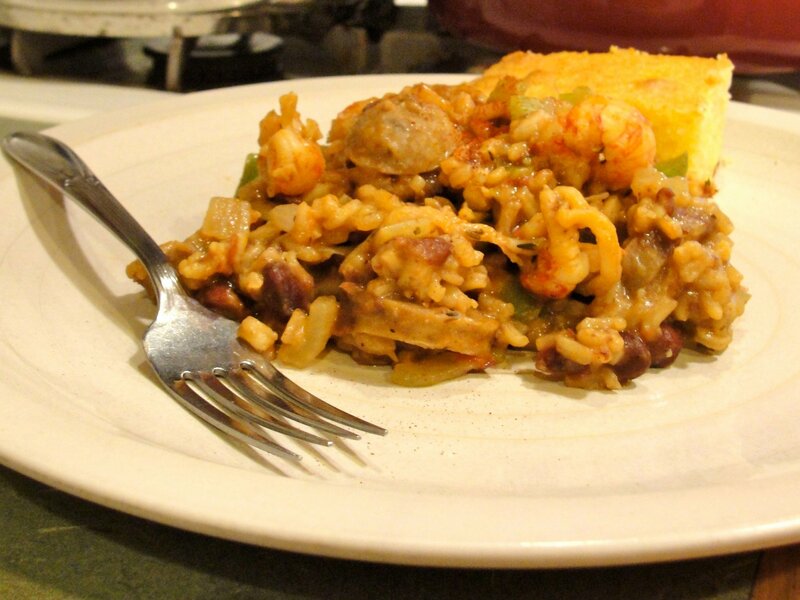 (Yes, I know beans are not a usual ingredient in Jambalaya. :-) While that is cooking, sautee celery, onion, green pepper, one serrano pepper, tomato, and 2 cloves garlic in olive oil. Combine meats, e.g., two sliced hot italian sausage (cooked) and about 1/2 pound of cooked Langostino tails (cooked) with seasonings: smoked paprika, salt, black pepper, cayenne (sparingly), oregano, thyme. Mix everything together for about 4 reasonably generous servings. The corn bread was from Trader Joe’s mix. It’s good (moist, yet crusty at edges), but on the sweet side.